Here are ten reasons we school year round and what that looks like for us. We take longer breaks in the spring and fall when the weather is perfect. Unless you live near the beach (in which case, pat yourself on the back and move on to number two), you are pretty much guaranteed to have miserably hot summers and possibly even bitter cold winters. It’s generally a lot more pleasant to be indoors draped over the air conditioner hitting the books in July and August than it is to be out and about. At least that’s the case here in Missouri! We get to take the entire holiday season off! That means more time for holiday gatherings, singing carols, and really focusing on the reason for the season. This year we will break from the second week of November through the first or second week of January giving us plenty of time to prepare for and celebrate Thanksgiving, Christmas, and the New Year. Because we school more weeks of the year, our days and weeks are lighter which leaves room for this mama to take better care of the house and yard. Homeschooling a shorter, more concentrated school year is too intense for me. I end up giving it all my time and attention allowing other things to slide. When we school year round my house stays cleaner, we eat healthier, and we spend less money on conveniences. Learning is a way of life for many homeschoolers, not just those who school year round; but, for us, doing our lessons is a natural part of our every day routine. My kids love school. They love to learn new things and explore new ideas. There are always new books to discover and old ones to revisit. Because we do not attempt to recreate a traditional classroom at home, my kids are always eager to learn and learning happens anywhere. Whether we are observing a new backyard visitor or discovering how to convert from kilos to pounds at the local grocery store, we are always learning. (Yes, I said we — I am learning too, right alongside my children!) Schooling year round fits right into this lifestyle of learning. There is no “summer slip” or loss of academic skill due to several months off from academic subjects. Because the kids are constantly using their knowledge — particularly in subjects like math where the information is built upon previous know-how — they do not experience the summer brain drain traditional teachers dread. That means we do not have to spend the first part of each new year in review, but can move on to new material and spend our extra time exploring things they are interested in! Children thrive on routine. I thrive on routine! We do not keep a schedule that tells us “at 8 o’clock you must do this,” but each day we follow a familiar routine that leads us comfortably from one activity to the next. And we thrive on it! In fact, Mondays are one of my favorite days of the week because we get to return to our routine after being out of whack over the weekend! This routine ebbs and flows with the seasons, but it is always there throughout the year and we never have to get readjusted to a shockingly new routine. If everybody catches the flu and mama doesn’t get out of bed for four days straight, it’s okay. You will not have the pressure of being behind schedule when you school year round. Whether you have to log a certain number of days or hours to meet your state’s requirements, schooling year round grants you the ability to absorb those unforeseeable bumps in the road — or sometimes even the foreseeable ones like having a new baby! My children get to enjoy their childhood. They will not be stuck behind a desk on glorious spring days wishing they could go chase a butterfly or climb a tree. Instead, they will be able to finish their lessons in just a few short hours and have the rest of the day to follow their personal delights. Childhood is so very short and once it is gone you cannot get those years back. I’m so happy knowing we have structured their learning in such a way that they can make the most of their young years. Smaller, more frequent breaks save my sanity. Usually by the end of a longer chunk of schooling (six to eight weeks), there are areas of my house that are badly in need of attention. Clutter has accumulated, the baseboards are grimy, the ceiling fans need dusted, and paperwork needs to be filed. These things get pushed aside during our regular routine because I run out of energy or the kids are too engaged in what they are learning to stop and do extra housework. Our regularly spaced breaks are a lifesaver! What some might term “spring cleaning” gets to take place every six to eight weeks around here. I am able to take some time to catch up around the house, to cook a few extra freezer meals for the crazy days, and maybe, if I’m really lucky, to sit down and sew something! 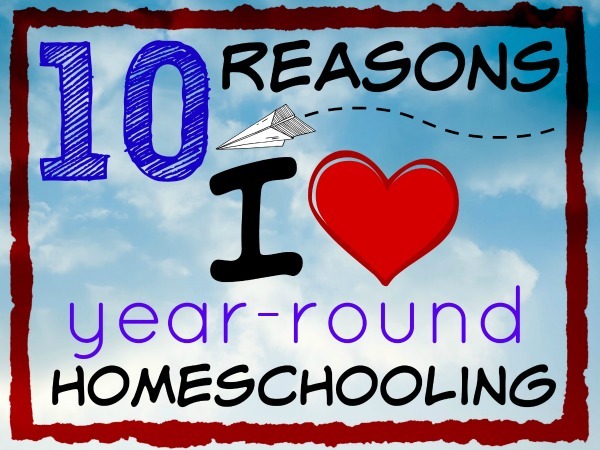 If my reasons for schooling year round don’t resonate with you, don’t feel bad! A year-round schedule is not for everyone and you must choose what is best for your family. This article was originally published in June 2015 by Home & School Mosaics.